I have always had a calling to serve the public by using my analytical skills to anticipate needs, creatively solve-problems, and help others learn. –WordPress.com Support Forums: As Pcosta88 and in the WordPress.org forums as the same here. -Write WordPress.COM support documentation: WordPress Applied Research. -Provide personalized video and visual assistance. This method has won the gratitude of many users as evident by the 100+ views of my YouTube WordPress Tutorials. –Freelance WordPress.org projects. See Web Development for description. -Taught users how to create, configure, and set-up their websites. -Answered customer support tickets over email, forums, and live chat. -Achieved a positive feedback score of 9/10. *Knowledge of HTML, CSS, and PHP programming at Code Academy and TreeHouse. *Proficient with Web Development Tools, Google Apps and Docs, MS Office, Mac OS. *Experienced in troubleshooting blogging/outreach tools: RSS, Newsletters, Social Media, Video/Audio, iMovie. *Researched and edited a self-published book. *Researched and created helpful historical documentation on radio gear during World War II. *Wrote and collaborated on a 49-page instructional curriculum. *Invited to give presentation on civic education at state conference. *Incorporated web/digital tools to organize school ceremonies, fund-raisers, clubs, and events. *Craft tutorial videos for subjects I enjoy. *Beginner level/college-level coursework in German and Farsi (Persian). M.A., Political Science. Focus on Political Analysis and Elections. Completed thesis. B.S., Education. Focus on social studies and educational technology. Manage classroom and learning environment for 120 students. *Teach students how to program computers: Scratch, PHP, HTML, CSS, Python, C++. Managed classroom blog/site using WordPress and taught students how to use/interact with WordPress. *Created instructional materials and support documents to anticipate the needs of 150 students and helped them be successful. *Developed positive rapport with stakeholders and students. *Managed classroom blogs, newsletters, and crafted elearning modules in Articulate. *Craft training materials to teach lessons and concepts. *Responsible for anticipating the needs of 90 students. *Created educational materials for 110 diverse students, built rapport, and helped students succeed. *Used e-mail newsletters to communicate with parents and developed a classroom blog. *Head coach of 30-member track team. Planned 15 training-practices and three track events. *District Coordinator for the We the People program. Trained three teachers to use the program. *Collaborated and communicated with stakeholders to manage 30-member student government. *Responsible for creating educational/training materials to anticipate the needs of 90 students. *Researched artifacts, used technical equipment, and maintained databases. *Developed rapport with museum patrons and answered questions. *Managed “hands-on” teaching cart in Polio Exhibit. –First Place in District for Stock Market Game, 2013. 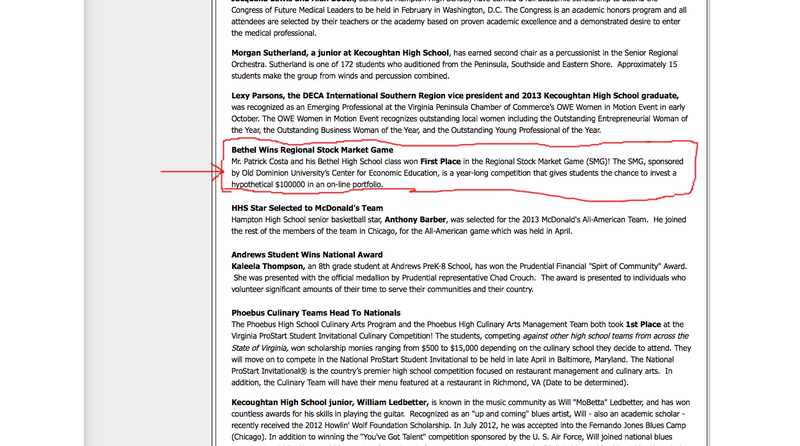 -First Place in District for Stock Market Game, 2012. -Farsi Foreign Language Scholarship, 2012. 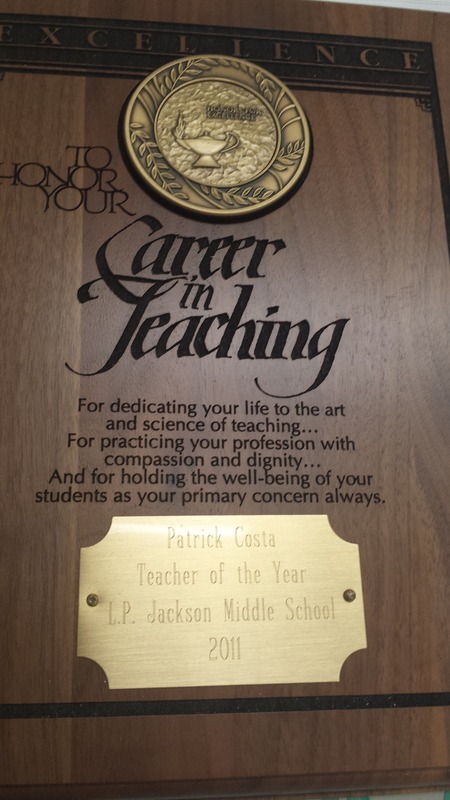 –“Middle School Teacher of the Year“, 2011. –Jamestown-Yorktown Foundation Certificate of Appreciation, 2011. -Inducted into Pi Sigma Alpha and Phi Alpha Theta honor societies, 2003. -Eagle Scout, Boy Scouts of America, 1998. References, Letters of Employment, and Complete Transcripts are available upon request.